This go-round, the handsome prince is the center of attention, as the wicked queen and her lovely stepdaughter stage a battle royal for his hand, and the fate of a kingdom hangs in the balance. Directed with high camp by Tarsem Singh (“Immortals”), “Mirror Mirror” piles on the one-liners and innuendos, along with life lessons that range from the need to help the poor and fight discrimination to the importance of promoting feminism. The end result is a bit leaden and somewhat charmless for a children’s fairy tale. But remarkable costumes and grand set pieces go a long way to compensate. 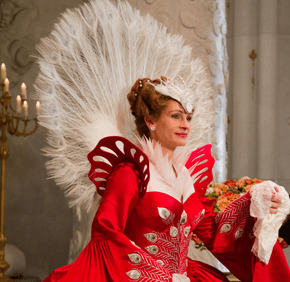 Playing against type, Julia Roberts is the evil Queen, chewing up the scenery in glamorous ball gowns, and revealing her character to be insecure and afraid of growing old. The magic mirror offers a creepy-looking self-image that dispenses bad advice. With her stepdaughter, Snow White (Lily Collins), locked away in the tower, the Queen sets out to find a rich husband, whose fortune will save her bankrupt realm. The populace is poor and starving as a result of the crippling taxes exacted to support the monarch’s lavish lifestyle. Her luxuries of choice include some gross-out spa treatments — who knew pigeon droppings made the best ingredient for a facial? Enter on horseback the fabulously wealthy Prince Alcott (Armie Hammer), who catches the eye of both the Queen and Snow White. The Queen eliminates the competition by banishing Snow White and ordering her killed. But the hapless royal butler, Brighton (Nathan Lane), weakens, and Snow White escapes into the forest. There she stumbles upon the Seven Dwarfs. Viewer, beware: These are not the endearing dwarfs of Disney lore. They are a wisecracking band of hoodlums with names like Napoleon (Jordan Prentice), Wolf (Sebastian Saraceno), and Butcher (Martin Klebba). They steal for a living, but Snow White persuades them to spare the poor and take from the Queen instead. They, in turn, teach her the ins and outs of street fighting. Cross Robin Hood with Joan of Arc and you get the picture, as Snow White leads a crusade of diminutive warriors to overthrow the Queen, snag her Prince Charming, and live happily … well, you know. It does, in its own unique fashion. The film contains mild action violence, some rude humor, and one semi-profane utterance. The Catholic News Service classification is A-II — adults and adolescents. The Motion Picture Association of America rating is PG — parental guidance suggested. Some material may not be suitable for children.